Morning service at St Paul's church Worcester. In this week's morning service at St Paul's church, Dot Burnett continues with our theme for this year. 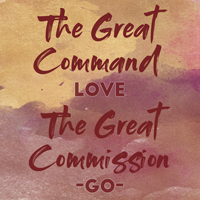 ‘The Great Command - The Great Commission’ and focuses on the subject of Going Deeper. You can see the PowerPoint presentation that Dot used during her talk in the Link below. To Download the sermon from this morning's service, right click on this Link and 'Save As' or left click to listen in a new page or new tab. Or you can just click on the play button above to listen now in the currently open window. You can also click on the link in the downloads area on this page. If you have any issues listening or downloading this sermon or any other sermon. Then please click Here to send an email to peter.lawrance@stpaulschurch.co.uk with the issue. Please give sermon date and if morning or evening.